1169 Shettleston Road, Shettleston, Glasgow. G32 7YS. Tel: 01417781624. The Portland Arms is one of the most historic pubs in the east end of the city. Built in 1938 for Jonathan Tindal by architects Thomas Sandilands & MacLeod, 248 West Nile Street. 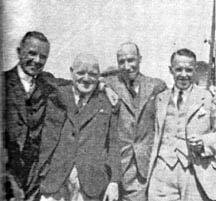 Mr Tindal acquired the old Portland Arms in 1922 as a trustee on the estate of the late Mr Alexander Robertson. Jonathan Tindal started his experience in the licensed trade with Mr Grant in the Royal Restaurant in West Nile Street, before that he worked in the railway. Jonathan prospered and in 1930 took over a second pub, the Argyle Bar, Glassford Street from well known publican Maxwell Duff. The history of this old pub can be traced back to 1842, over the years the proprietor had his name above the doorway until Mr Robertson acquired it in the 1880s, the name was then changed to the Portland Arms after his other premises in Troon of the same name. Mr Robertson became a Bailie of Troon. When Jonathan became a trustee in 1922 the pub to him was just an old mans drinking den. Compared to other pubs in the area the Portland Arms was well up to the usual standard for comfort and well enough equipped, but it was just a pub and did not satisfy Mr Tindal's own ideas as to what a good public house should be. His idea was that there should be plenty of room. Customers should not be forced to stand at the bar, unless, of course, they prefer to drink that way, and so plenty of seating accommodation should be provided. In order to bring his ideas into force Mr Tindal took over a tenement next door to the old Portland Arms. 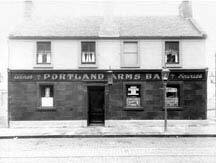 He knocked the tenement down and had the new Portland Arms erected at 1169 Shettleston Road. He had the licence transferred and the old place lay derelict for a short time. Jonathan Tindal also owned premises at 33 Glassford Street, City Centre. A trip to the Lake District. Left to right W H Wyllie, licenced grocer, Duke Street, Jonathan Tindal, Portland Arms, Shettleston Road, W R Campbell, publican, 1137 Tollcross Road now the Kimberley and David Stewart, publican, 174 Westmuir Street now O'Kane's. 1934. One can fail to notice that the Portland Arms now stands slightly back from the building line of the street and has accordingly a large pavement space in front of the pub. The front lower part of the building, up to the window sills, is of black granite, with facing brick above and stone frieze and coping. A service hatch had been provided in the base for lowering supplies into the cellar. The sign "Portland Arms," is in "stay-bright" steel lettering with a red Neon sigh set into them. There are four windows to the front, in the middle, a double teak swing door. Through the door one enters a small vestibule which is of modern design with a terrazzo floor. To the right and left there are doors to the bar, and, in front, the family department with a window into the bar. The doors are of walnut wood. Inside, and including the sitting rooms, there is seating accommodation for 150 people. The general lay-out is a central bar with rooms both at the front and back. One is immediately struck with the spaciousness of the bar. 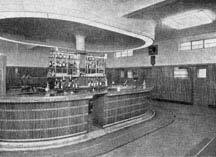 Interior view of the Portland Arms shortly after completion. 1938. The panelling on the walls is of walnut wezebranni bands. So also is the side of the circular counter in the middle. Stay-bright steel pipes connect barrel with counter, the top of which is of polished walnut with zebranni bands. Over the gantry the ceiling has been lowered to form a canopy with concealed lights. There are six sitting rooms, two of them are situated in the front, on either side of the door. They have windows both to the street and to the bar. There are four rooms along the back wall and they also have windows to the outside and to the bar. They are all fitted with bell presses for service. A striking novelty is that when the door of a sitting room is closed practically no sound can penetrate from outside. The back sitting rooms adjoin an open garden. One of the front rooms, with separate lavatory accommodation opening off it, is reserved for ladies. Today nothing much has changed over the years, the canopy has gone as so has Mr Tindal. Many regulars have drunk here just like their fathers, many of whom are honoured by a brass name tag where they used to sit, this is a working man's pub and is the oldest surviving art deco bar which is now a B listed building. Interior view's of the Portland Arms, August 2005. Masons- John Green & Co Ltd, St Vincent Street. Joiners- Mr Andrew Bennie, Barrowfield Street. Plasterers- George Davidson & Co, Bath Street. Plumbers- William Hendry & Son, St Vincent Street. Slater and Rough Cast work- John McLaren, Paisley Road. Electrical Work- R I Sinclair, St Vincent Street. Glaziers- McDonald & Hughes, North Woodside Road. Terrazzo Work- Toffolo Jackson & Co, West Regent Street. Painter- Robert Bell, Shettleston Road. French Polishing- Henry Hutchison, North Hanover Street. 1973-1950 Agnes McIntosh Wright Tindal Wallace.